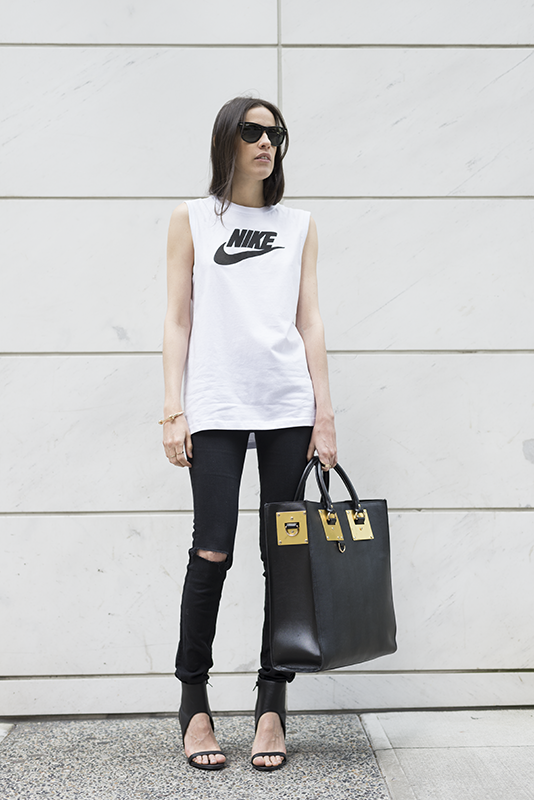 WEARING: Nike Tank, J Brand Jeans, Sophie Hulme Tote Bag, Shoe Dazzle Heels, 8 Other Reasons, Zara Bracelet and Ray Ban Sunnies. Super excited to announce that we shot our TWO M PROJECTS lookbook over the weekend!!! There are some people that I have to thank for their support and help over the past few days of madness, as well as the actual shoot. My boy Jeff (for being the best support I could have asked for), M'c Kenneth (I have nothing but love & respect for you) Carmin, Courtney, Terry, and Ross. I also want to send a quick thank you to my friends who were not in the studio, but who have been there for the past 8 months, supporting my work and personal growth (you know who you are). It is such a great feeling seeing when a collection comes to life, it was an amazing day. Lots of hard work. I can't wait to launch this collection with Meryl, February 2015 can't come soon enough. In these photos you will notice that I didn't even remember to grab a jacket when I left the house, so much was on my mind getting things ready. 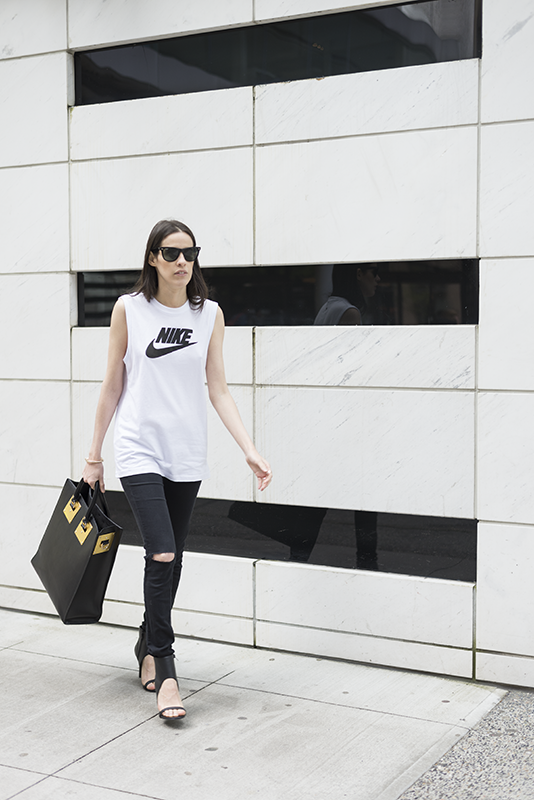 I wanted an easy look with an oversized bag to carry all of the things I needed to buy & pick up prior to the shoot. Can't wait for the look book! I want a pair of jeans like that so bad! This outfit is perfect. 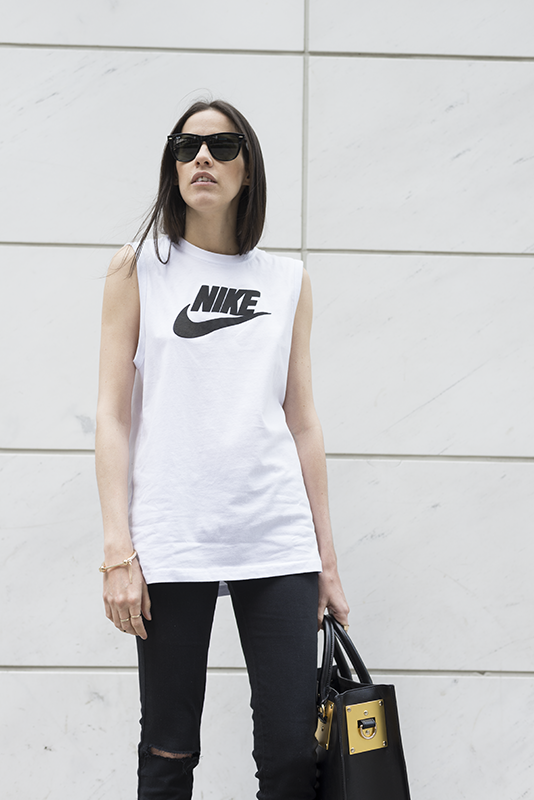 That Nike shirt is the perfect sport but fashionable Nike shirt that I've ever seen. And your heels! They're so lovely! we're all behind you , supporting you.. good luc\k Mel! Good luck :) And I love the look! simply perfect! love your bag! Thanks for sharing your good news! As always, you look impeccably stylish here and I love the ripped-knee J Brand jeans, along with how you've styled them - so on point! Hope you're having a great week so far..
cool shoes! love this outfit. Your bag is stunning ! Cool shoes, I like that design. love the outfit and happy for you!!! SO EXCITED FOR THE COLLECTION!